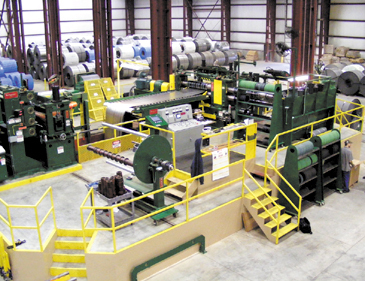 Decatur, AL - Magic Steel, a multiple location metals distributor and coil processor, has installed a 60,000# x 72" high-performance Double-Loop Turret Head™ Slitting Line in its new coil processing center in Decatur, AL. The new line is Magic Steel's 4th Turret Head™ Slitting Line. 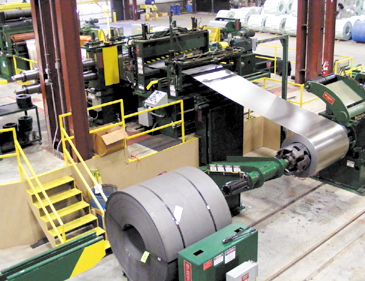 The new Magic Steel Slitter has 750 HP available for processing 60,000# bare, galvanized, and pre-painted coils in widths to 72", at slitting speeds to 1,000 FPM. Coil gauge capacity ranges from 0.009" minimum through 0.135" maximum. The high pass line system configuration allows Magic Steel to process coils without forcing the strip to bend against the natural coil set. The result is quick and easy coil threading, elimination of reverse-bend coil breaks, and elimination of strip surface damage from roll scuffing. The configuration conserves floor space and provides for superb coil tracking at both entry and exit ends, which results in superior slit coil quality. 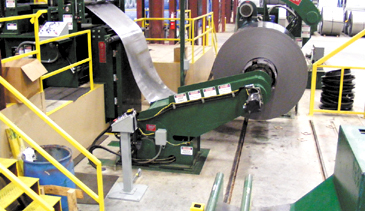 A non-contact hydraulic servo Edge Guide automatically guides and aligns the coil edge into the Slitter at all line speeds. Pushbutton adjustable Roller Guides with electronic position readouts make coil threading and tail-out fast and effortless. A Hydraulic Guillotine Shear crops coil heads and tails and collects the scrap in a Scrap Car for quick disposal. 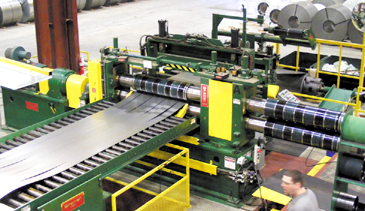 Surface-critical coil is efficiently processed in a "Double-Loop" slitting mode wherein a variable speed motor driven loop-control Uncoiler drives the strip into an "above-the-floor" free-loop, allowing for precise tension-free thin gauge slitting. Tension-free slitting can achieve closer slit width tolerances while eliminating tooling induced strip surface scuffing. In addition to the Double-Loop mode, a "Single-Loop" and two (2) "Tight-Line" operating modes are available for slitting medium and heavier gauge high-strength coil. A precision quick-change Turret Head™ Slitter produces precise width tolerance slit strips with minimum burr throughout the entire range of gauges and mechanical properties. Two (2) quick-change heads allow Magic Steel to conduct an efficient just-in-time production program and respond quickly to customer demands.